There are two types of people you see when you travel: the person running through the airport, probably late for check-in, with a tattered, misshapen rolling bag — and the person effortlessly strolling through security with a single, beautiful duffel bag. Quality luggage is an amazing thing to have in your adult life, and not just because it can make an impressive statement during your (imaginary) catwalk through the airport — because luggage made from premium materials can last a lifetime. 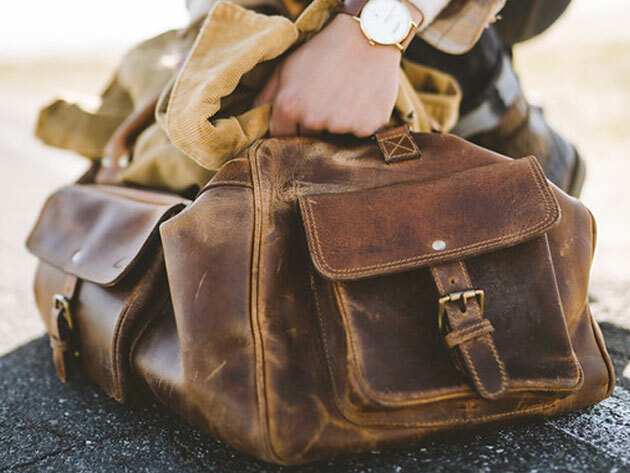 Just look at the bags from Kodiak Leather: it's a completely family-run and operated business that's a nod to old fashioned luggage-makers, making heirloom-quality bags made to last for generations. These bags aren't just beautifully made, they're durable enough to take with you during winter trips to snowy cabins and stylish enough for excursions in the city. 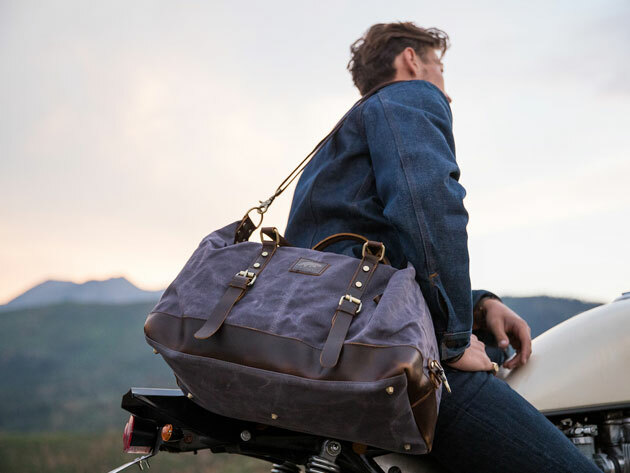 Ideal for weekend trips, long getaways and more, these bags are made by hand with care — and are intended to be passed down from one explorer to another in your family. This Kodiak Leather Weekender Duffel Bag in Antique Brown is the perfect day-tripper bag, with built-in handles and a shoulder strap. It's 30L big and helps you stow your things with interior and exterior pockets. 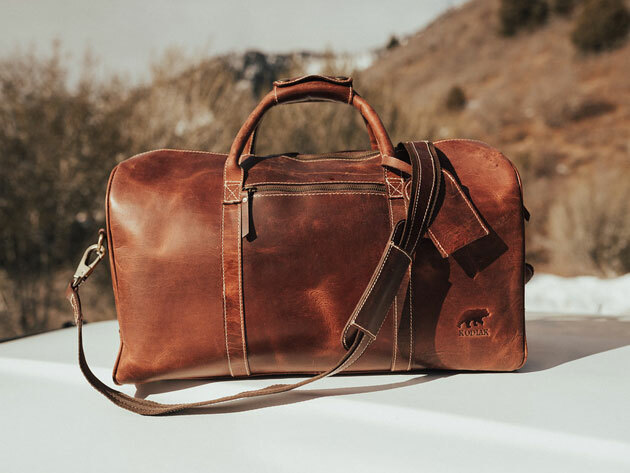 Buy it here: Usually, this Kodiak Leather Weekender Duffel Bag in Antique Brown is $340, but you can get it here for $269 — and use coupon code MADNESS15 for an extra 15% off. If you need even more space, this Kodiak Leather Weekender Duffel Bag in Antique Brown can help you carry 60L worth of your things with ease. 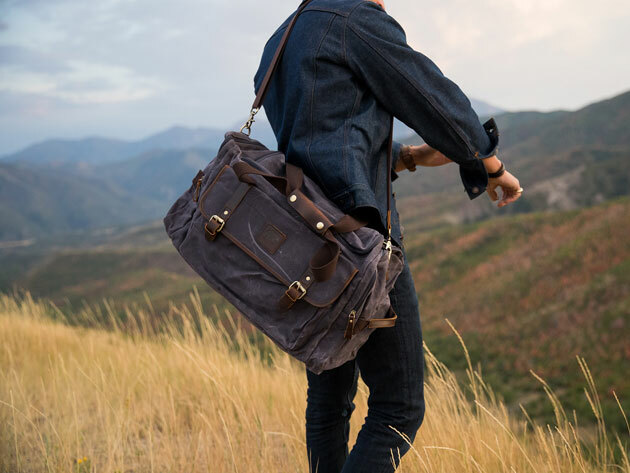 The premier quality buffalo leather construction makes it a bold statement piece that you can take with you anywhere. 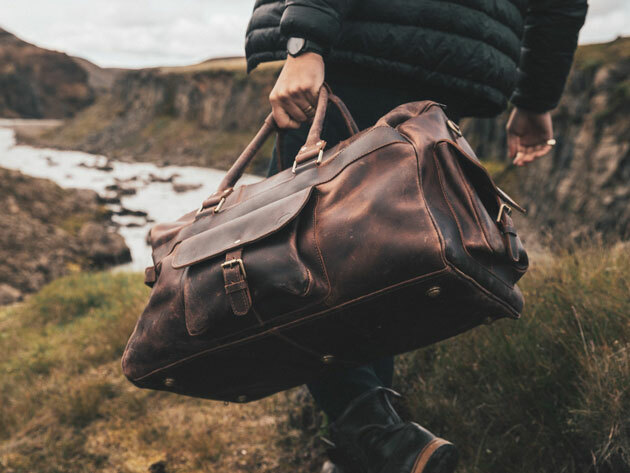 Buy it here: Usually, this Kodiak Leather Weekender Duffel Bag in Antique Brown is $499, but you can get it here for $399 — and use coupon code MADNESS15 for an extra 15% off. If you're looking for a unique piece that combines leather and canvas, look no further than this Kodiak Denali Duffel in Gray. Featuring genuine leather and waxed canvas, its 25L size makes it the perfect pick for a weekend trip. Buy it here: Usually, this Kodiak Denali Duffel in Gray is $175, but you can get it here for $149 — and use coupon code MADNESS15 for an extra 15% off. With a more minimalist exterior and magnetic exterior pocket, you can use this Kodiak Augustine Duffel in Gray for everything from a spur-the-moment weekend getaway or as a commuter bag. Buy it here: Usually, this Kodiak Augustine Duffel in Gray is $175, but you can get it here for $149 — and use coupon code MADNESS15 for an extra 15% off. 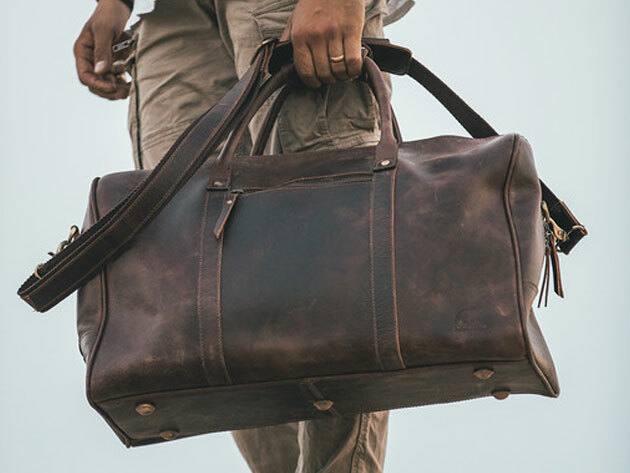 Jet-setters and outdoor explorers will love this Kodiak Leather Weekender Duffel Bag in Dark Walnut. The dark leather makes it a durable and eye-catching choice for all your adventures. Buy it here: Usually, this Kodiak Leather Weekender Duffel Bag in Dark Walnut is $340, but you can get it here for $269 — and use coupon code MADNESS15 for an extra 15% off. Adventure boldly with this Kodiak Leather Weekender Duffel Bag in Dark Walnut in the largest 60L size: take it with you on longer trips and carry all your essentials with ease. Buy it here: Usually, this Kodiak Leather Weekender Duffel Bag in Dark Walnut is $499, but you can get it here for $399 — and use coupon code MADNESS15 for an extra 15% off. This light tan waxed canvas and leather Kodiak Denali Duffel in Tan works as equally well for your morning commute as it does for a weekend trip with your friends. 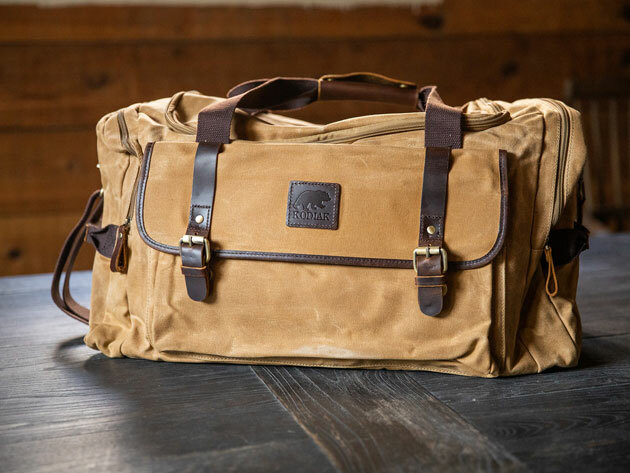 Buy it here: Usually, this Kodiak Denali Duffel in Tan is $175, but you can get it here for $149 — and use coupon code MADNESS15 for an extra 15% off. 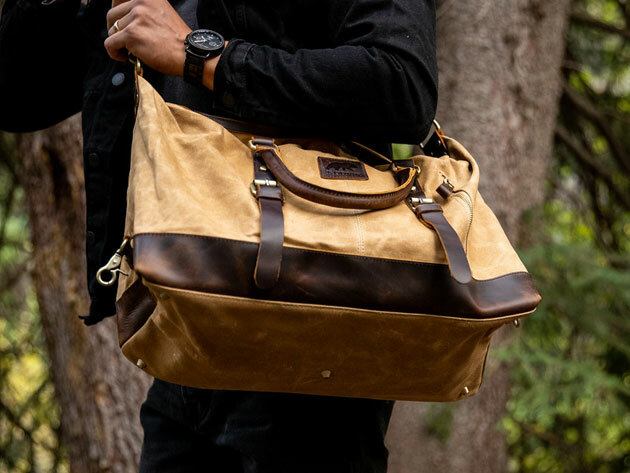 The sophisticated block design of this waxed canvas and leather Kodiak Augustine Duffel in Tan is eye-catching and attractive — and it's durable enough to take with you everywhere.